Find yourself. It is clear that clothing should be not only beautiful, but also form a harmonious whole with the figure and form of man, to emphasize its natural beauty and to hide figure flaws and looks. Every garment in some way changes the appearance of the person, that we have to use, but to make the change deliberate. It is very important therefore to know the means by which you can hide figure flaws, make it one or the other. To achieve the desired effect can be the right choice for uniforms, the skilful use of details, finish, texture, pattern and color of the material. The use of dress form for visual defect fixes build promises a lot of interesting things. Most often, the challenge is twofold: to give a certain shape to the entire figure or some of its parts. Disguise all the figures will help the right choice. Full should be avoided clear outlines and straight lines, creating a sharp silhouette, not to identify a discrepancy figures with this silhouette.Women with wide hips can't afford a silhouette, extended line shoulders and tapered down. For shapes, full at the top, do not recommend the a-line silhouette. Not recommended for full covered dress form, but too big is also contraindicated. Tightened shape do not fit and slim figures. For such clothes more three-dimensional, ruching, pleats, folds, Drapes. Correction of the shape of the figure on separate sites is also an important point in the simulation. Shapes with a flat chest it's best to choose uniforms with an oversized bodice. It is necessary to give some grandeur in the chest area due to assemblies, folds, puff, invoice details (pockets, flaps, ruff, ruffles and t,on), collars, turning into bows, ties, etc. (Fig. 54, 55, 56). For a figure with narrow hips you can use the cut of the skirts that create content in this area: Assembly, soft pleats, flared, pleats,. 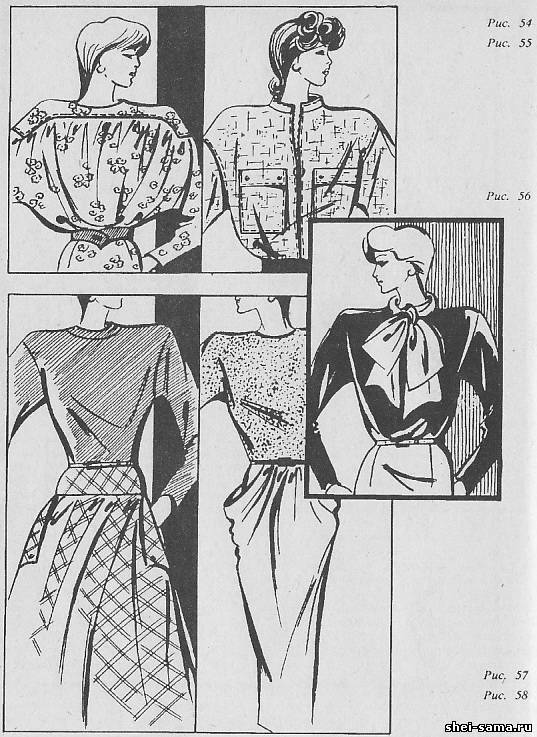 Straight skirts can be finished with oversized pockets (Fig.57, 58). 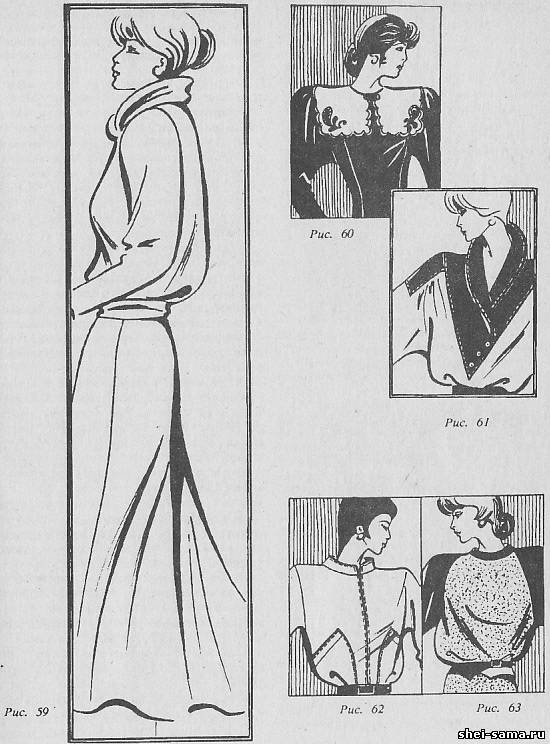 The slouch shapes can reduce the shape of a collar, slightly retarded from the neck on the back. You should not choose clothes without collar or with collar type, narrow rack. Have stooped the pelvic girdle, usually served to the side of the front that visually reduce the buttocks. In this case, the relevant overlap on the bodice, loose skirt (Fig. 59). Pereghibati figures correct clothing free forms of direct and trapezoidal silhouette. Nice strapless bodice with a slouchy fit at the back. Sloping shoulders will hide the sleeves, the sleeves are cinched with oversized heads, large collars, capes, applied the finishing details in the shoulder area and, of course, with modern fashion - shoulder pads (Fig. 60). Narrow shoulders visually expand a different kind of capes, wings, lowered shoulder line and the shoulder line is structurally enhanced with shoulder pads (Fig. 61).High shoulders do not allow the clutter of items in this area, relevant stand-up shape collar of moderate width, slightly behind the neck or standing-collar, vtechenie in the extended neck (Fig. 62). Broad shoulders fit for clothes of modern forms, but if desired, they can be reduced by using the shape of the Raglan sleeves and proregion (Fig. 63). Possible collars smooth. In a dress with a narrow bodice and wide skirt, the shoulders will seem to have. Wide and high the chest can be visually reduced vertical trim lines, soft bodice, semi-fitted silhouette. Wide but flat chest should not be emphasized strongly fitted bodice (Fig. 64). The deviation in the position of the waist can also make invisible to the eye. The high waist will hide dress, cut below the waist, straight or slightly form-fitting (Fig. 65). Low waist will hide a dress with a high line, with wide belts and extended skirt (Fig. 66). Wide belts should not be worn to women with wide hips. The lack of a waist line will not be so noticeable in direct dresses and blouses. If the figure is not complete, relevant waist, slightly extended skirt and strapless bodice. Women with wide hips should not wear skirts, sharply tapered. Bulging belly can be masked pokrainini and patch pockets at the hips, drape. If hips are not sufficiently rounded, they can be visually round off the extended skirt at the waist line. Choosing the shape of the sleeve, it is necessary to consider not only the cut of the dress, but the shape of the hand. Full hand must be concealed by sleeves. If the figure is thin, and his hands full, offers all forms of sleeves, in addition to narrow. Full women fit cap sleeves with gusset, long set-in sleeves. Summer dresses sleeves to the elbow. Not quite slender legs you can hide wide-leg pants or long skirts. With a long torso and short legs can wear pants and long skirts are not recommended. To change the proportions of the figure to the best possible use of vertical and horizontal lines on the product. Increase the height and reduce the width of the shape is vertical reliefs. Horizontal stripes located on the bodice and skirt of the dress visually enhance them. The shape of the neck needs to be selected not only in accordance with the style, but also taking into account the shape of the face oval, shape and length of neck, shape of the chin. Thin long neck visually shorten the round and square neck, cut-out base of the neck. Good variety of collars-stand, high stand-up-turn-down collars. Visually lengthen the neck neck, low turn-down collars. Strongly protruding collarbone Baring you should not. With an open neck, you should use ruffles, frills, etc.If the line of the collar, repeat the contours of the face, they emphasize a narrow face seem even narrower with a long neck, broad face with a wide neckline will seem even wider. It is necessary to avoid piling up of detail in that part of the figure, the size of which for one reason or another it is not desirable to increase. The model selection is carried out in sequence. First of all, determine where you will wear. It is necessary to adopt a critical approach to its external data, to take into account your personal wishes in accordance with nature, and only then begin to search. Not to forget the key point that we need to create the image of a man of our time, a man of high culture and modesty, charm and kindness.